The Junior League of Riverside, Inc's commitment to improving the lives of women and children in our community. 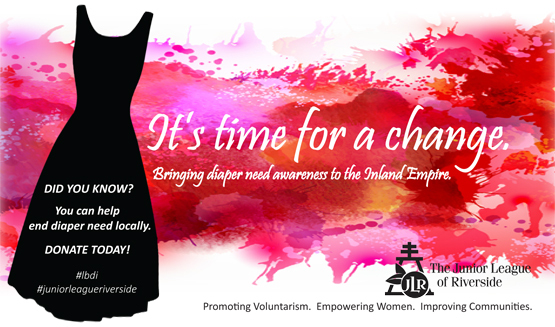 During the week of March 25-29, 2019 JLR members will be raising awareness of Diaper Need during our Little Black Dress Iniative (LBDI) week. Our league is focusing on the need for families to have access to enough diapers to keep their infant or toddler, clean, dry and healthy. Our goal this week is 15,000 diapers and $5000 to support the Junior League of Riverside's Diaper Bank. Some facts about diaper need in our community. Infants require up to 12 diapers a day and toddlers 8. 1 in 3 families experience diaper need in the U.S.
No federal or state program specifically assist with diaper need. Nationwide 57% of parents experience diaper need missed an average of 4 days of work or school due to lack of diapers. In California, day care for a single parent home can reach 60% of income. 2 in 5 families experiencing diaper need keep their child in the same diaper longer increasing the risk of rashes and urinary tract infections. 3 in 4 families experiencing diaper need are embarrased that they cannot afford diapers and 80% are hesitant to talk about it with even family. The Junior League Diaper Bank project was created and exists to combat diaper need across the Inland Empire.